Champions of The Round Table - The Big Fluke? I don't think D.J. 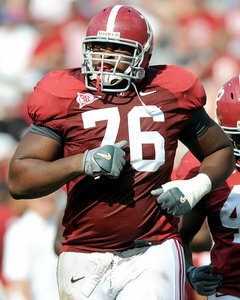 Fluker is a fluke, I think he is just untapped talent, smoothed over by a heavy topping of desire and eagerness. I went to the Spring game, and I saw D.J. play. Let's be honest, he wasn't very impressive. His footwork was just non-existent, he looked totally confused. He also looked winded at times. After watching that performance, I was disappointed. I had thought he would have been better prepared by then. He was bigger than Cody, and didn't have the mobility. I thought I had misjudged him from the beginning. That was then, and this is now....This is the D.J. Fluker I thought I was gonna get from the get-go. He's lost weight, he moves easier, and breaths easier. He has the talent, and desire to be a really good lineman. He's shown me that the hope I had for him to be a good player was not in vain. I am very proud of D.J. 's effort to work the kinks out.